After I get home from work and play with the animals for a bit, it's time for them to go to bed. 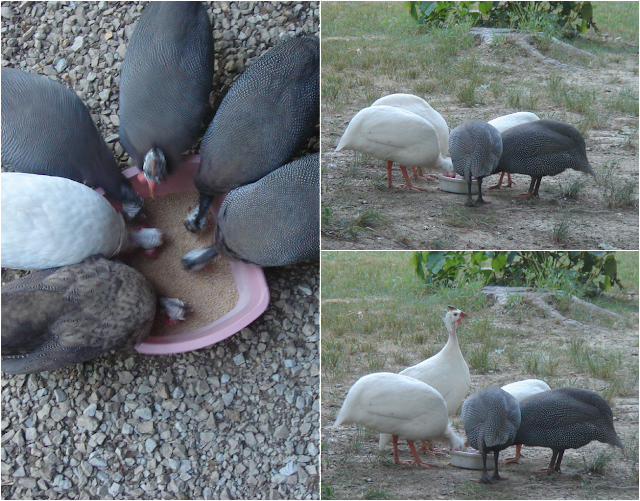 When it's getting close to dusk, the guineas stick around the house because they know I'm going to feed them! They go crazy for their food! Feeding them in the evening is a good way to make sure they come back close to headquarters to roost so Duchess can keep them safe by scaring away would be predators overnight. The chickens tend to go in for bed really early lately. Our rooster, Cam, encourages his girls to go in early to make sure they are all tucked in and safe come nightfall. Of course they have to get a little snack to tide them over until the morning. Once the feeding frenzy is over, things calm down and they all settle in for the night. Duchess! She must have swiped it when I wasn't looking and licked it clean. She reminded me of that funny dog Denver! I love Denver! And I love that your dog snagged yogurt. And I love her summer hair do. I can't explain it, but Feathered Friend Friday has become the highlight of Silas's week. He has to look at the pictures over and over and then he starts talking to the pictures and laughing. He just now told told the Duchess picture "sit down, drink it, eat it." 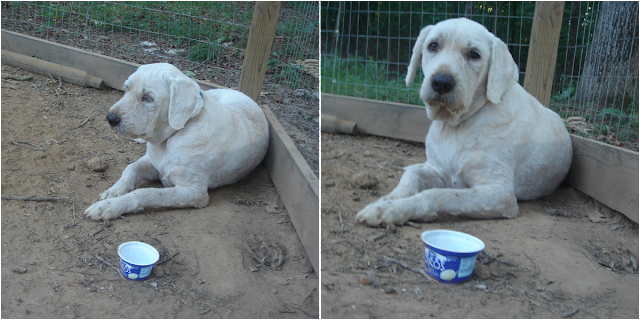 My Pearl wouldn't have just taken the dish away from the chickens, she would have shredded the bowl. Haha! Duchess isn't really too destructive, so that's good.